Boise State stopped Rashaad Penny and ended San Diego State's unbeaten start. 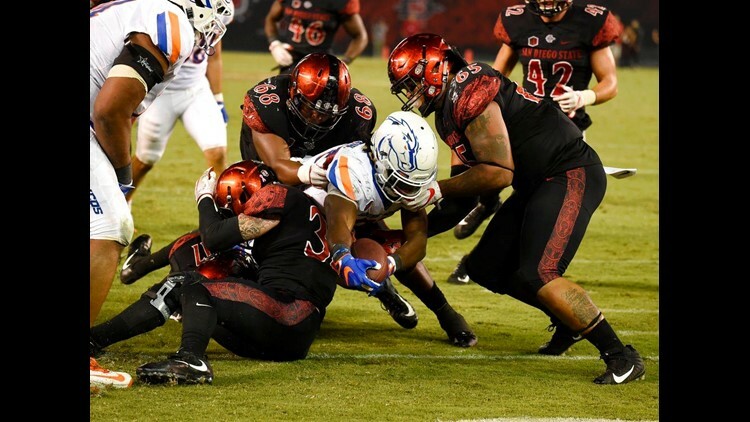 SAN DIEGO (AP) — Boise State stopped Rashaad Penny and ended San Diego State's unbeaten start. "When you run the ball for 100 yards every game, and you get held to that, that's got to be frustrating," said Boise State linebacker Leighton Vander Esch. "The offensive line was terrible," SDSU coach Rocky Long said. "Our running backs can't do what they need to do." "I thought all three phases showed up," said Boise State coach Bryan Harsin. "At the point of attack, we played physical, and it showed up throughout the entire defense," Harsin said. "The long pass probably should have sparked us a little bit," Long said. "It was a well-rounded loss," Long said.